The Lowndes / Selby Lowndes family stopped using Winslow Hall as a residence in the 1840s. It was let as a school, an asylum and a private residence to several wealthy families. In 1897 they put it up for sale, along with all their land in Winslow. The whole estate was 1,399 acres, of which about 1,083 were in Winslow parish. The sale catalogue was printed in London. 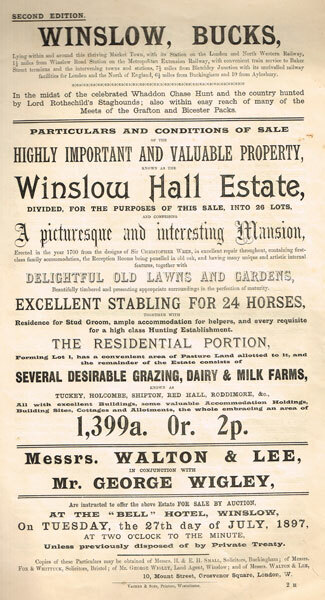 It is a masterpiece of estate agent's language (everything is "excellent", "fertile", "admirably situated"), and also provides a detailed survey of Winslow, naming every field, its use and its tenant individually - it was intended to be read in conjunction with the 1880 1:2500 Ordnance Survey map. 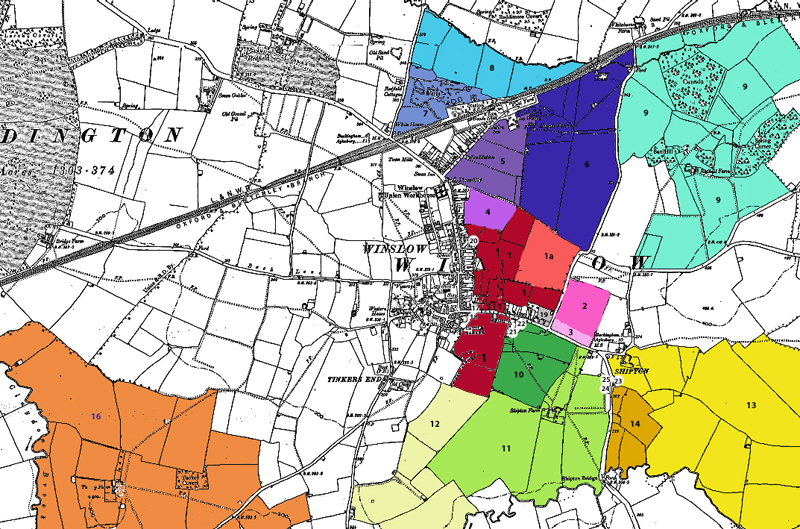 Winslow developed very differently to how the compilers envisaged: lot 6, "a very attractive small accommodation grass farm" is now the Magpie Farm estate, but lot 3, an "exceedingly valuable building plot" between Little Horwood Road and Shipton, and lot 7, "an eligible building estate" in Great Horwood Road, are still farmland, as is (largely) Dean [sic] Hill, Lot 10, "probably one of the finest building sites in the county". They were probably thinking of people building villas or hunting boxes rather than houses for the masses. Some of the land may have been bought by people who wanted to protect hunting interests, such as Mr Greaves of Western House. Lot 4, Bell Closes, is now the Recreation Ground (there was a cricket pavilion in the Hall grounds "formerly" used by the Winslow Cricket Club). Lot 7 included the Brickyard (north of the station) which had "a Scotch kiln of 23,000 capacity"; the tenant was Mrs Rebecca Foxley and in 1901 it was occupied by William Foxley, brick manufacturer, having failed to sell (the only lot which did so either at the auction or later). There were many allotments let privately at commercial rents as gardens, in Little Horwood Road, Station Road, Shipton and Great Horwood Road. 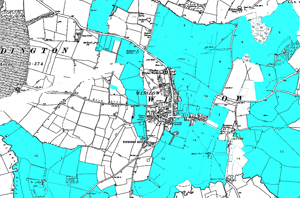 In 1897 the Lowndes family held nearly as much land as they had done in the 18th century after enclosure, as the maps above show. 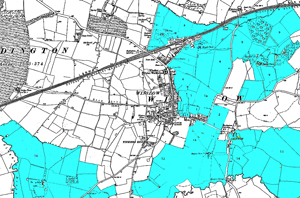 They had sold some land to the Lambtons for Redfield and some closes on the western edge of Winslow, and some had been used for the railway, but they had also acquired more land in Shipton. Winslow Hall itself was marketed as having "every requisite for a high class hunting establishment". Being at the heart of the Whaddon Chase Hunt was given more prominence in the catalogue than being designed by Christopher Wren. The sale included numerous coverts and spinneys which were important for hunting and shooting (these were 19th-century plantations rather than remains of ancient woodland). The Hall was offered as Lot 1 with 44 acres of grounds, wood and grassland let to various tenants (most of which is now the Elmfield estate). The land now known simply as Home Close is called Pliny's Home Close, and there was also a farmyard (now Claycutters). It did not sell at the auction in July, but was bought privately later in the year by Norman McCorquodale for £8,600. The table below gives the summary of lots on p.34 of the catalogue, with details of purchasers and prices from newspaper reports and annotations to the catalogue. 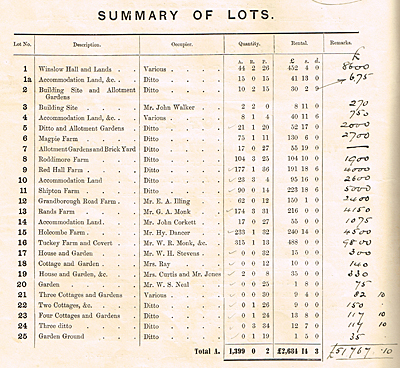 Some of the lots did not sell at the auction and were disposed of later, including 1, 8 and 16. There is a clickable map below which shows the locations of the lots. Hover over the map for a description of each lot, and click to take you to the relevant place in the table.